Figure 1. 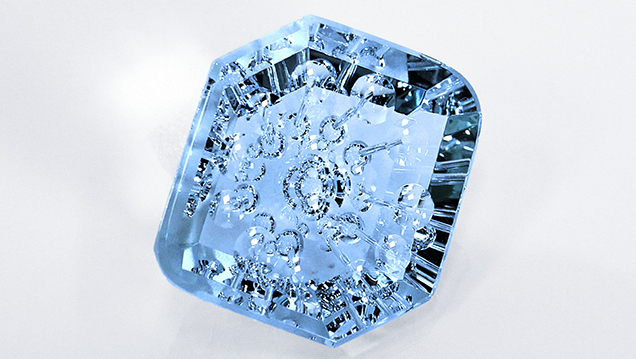 For 30 years, Michael Dyber has designed and fashioned gems, such as this aquamarine, in ways that please the eye and amaze the connoisseur. Photo by Albert Salvato. 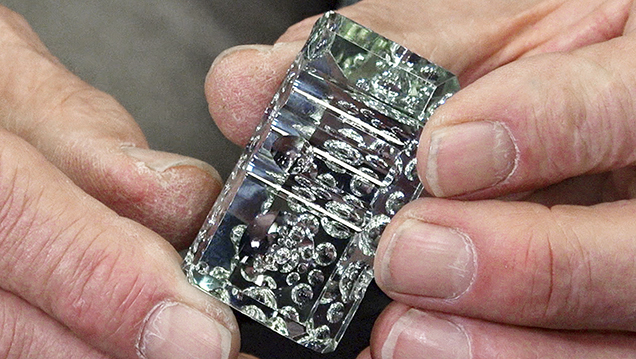 Michael Dyber (Rumney, New Hampshire) discussed how 30 years as a gem artist have influenced his techniques and informed the creation of his optically stunning carvings (figure 1). He believes his method is a gift, one from the heart, and knows that his approach would not suit everyone’s style. Dyber prefers to pay premium prices for flawless material, as flaws that cannot be removed during preforming affect the polished piece’s entire appearance. He finds sourcing rough to be a challenge and buys select pieces rather than lots of material. He also makes his own tools in his studio. When starting a piece, he chooses the rough by intuition and begins preforming the stone on a large grinding wheel by removing sharp edges and letting the lines and sides join together naturally. After preforming, he sits at the wheel with his handmade diamond tools and looks for inspiration in the piece, which he might find in the shape or an inclusion. Gem carver Michael Dyber provides insight into his process for cutting, carving, and polishing his unique pieces. “So instead of trying to force a design into the stone,” Dyber explains, “what I end up doing is sitting and looking at it and deciding, ‘Let’s start here,’ and not having to think about where it’s going to go. By doing this, and having this open-minded, I’m not confined.” Dyber works with the stone in three dimensions—from the front, back, and sides—without any dopping or affixing to a surface. He holds the stone throughout, even during the four-hour process of drilling each one-millimeter hole into a piece (figure 2); this allows for a more continuous workflow. He noted that the pre-polish is the most important step of all. Carving can be finished quickly, but the pre-polish requires a great deal of patience or else the scratches will remain in the piece for good. Over the past three decades, he has managed to reduce pre-polishing from six steps to three. While the work is time consuming, Dyber finds his work emotionally satisfying, because he gets to see the potential of the rough transform into the finished piece. Figure 2. Each hole Dyber drills into a gem, as in this Brazilian green beryl, can take up to four hours to complete. Photo by Albert Salvato. Duncan Pay is editor-in-chief, and Jennifer-Lynn Archuleta is editor, of Gems & Gemology.